Shirts With Random Triangles: Ole Miss DT Robert Nkemdiche's College Career Over Following Suspension and Declaration To Enter 2016 NFL Draft. It's the effective end of Nkemdiche's college career, as the news comes in conjunction with Nkemdiche announcing his intention to enter the 2016 NFL Draft. In a statement, Nkemdiche said that "While I wish I could have finished this journey with my team, I am grateful for the opportunity to have been a part of this program, and I am ready to begin the next phase of my life. "I have learned a valuable lesson in the last week, and I look forward to showing NFL personnel that this is not representative of my true character. I want to thank my coaches, my teammates and Rebel Nation for their support these past three years, and I look forward to making them proud for years to come." 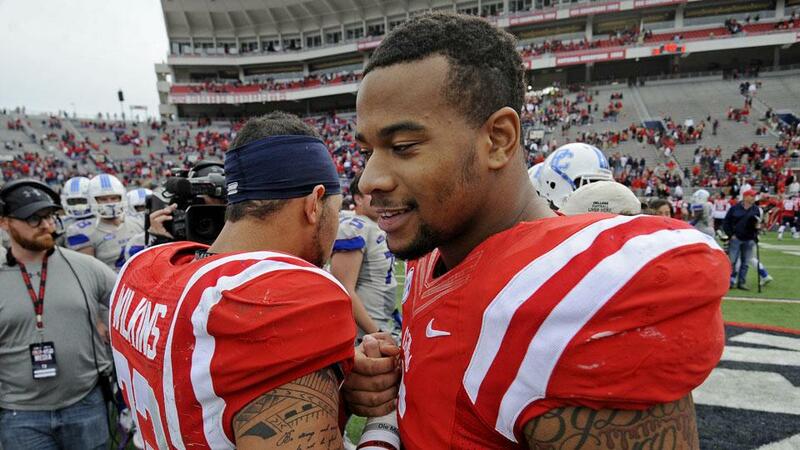 Nkemdiche learned of the suspension from Hugh Freeze and Ole Miss athletic director Ross Bjork this past week. Freeze said via statement that the school will continue to support him as he prepares for the next chapter in his life." Ole Miss will be facing Oklahoma State in the 2016 Sugar Bowl on Jan. 1, 2016.